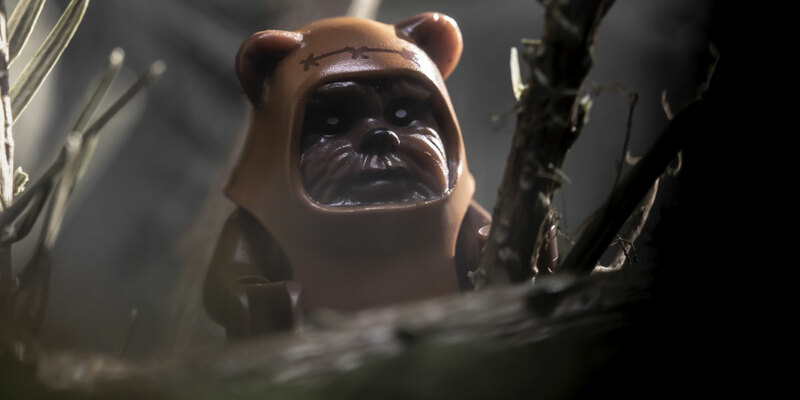 I created my recent Endor series as a challenge to push myself and see if I could create scenes that were based in a more real-world setting compared to my usual brick-built backdrops. 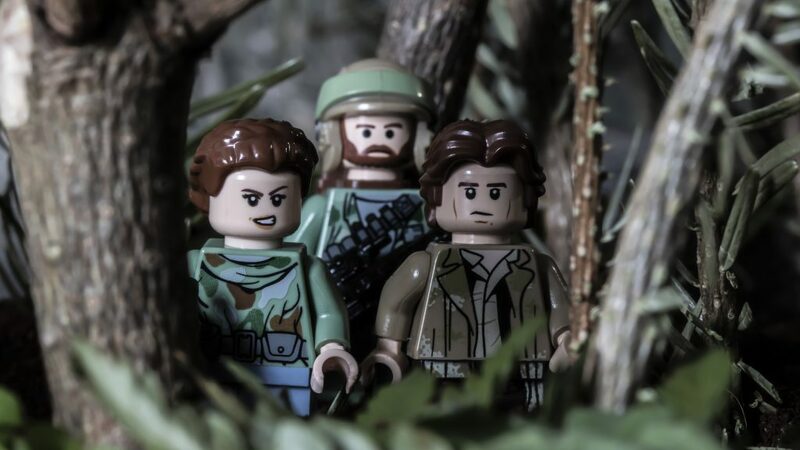 I also wanted to move away from creating direct recreations and instead use the Star Wars universe as a playground in which to create my own stories. 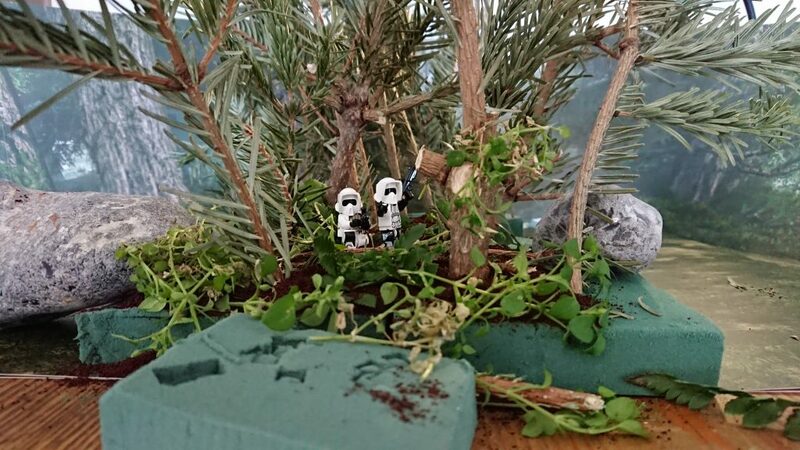 As all my photography is done at home I decided I would make my own scaled down Endor on my preferred place of shooting, my kitchen table. 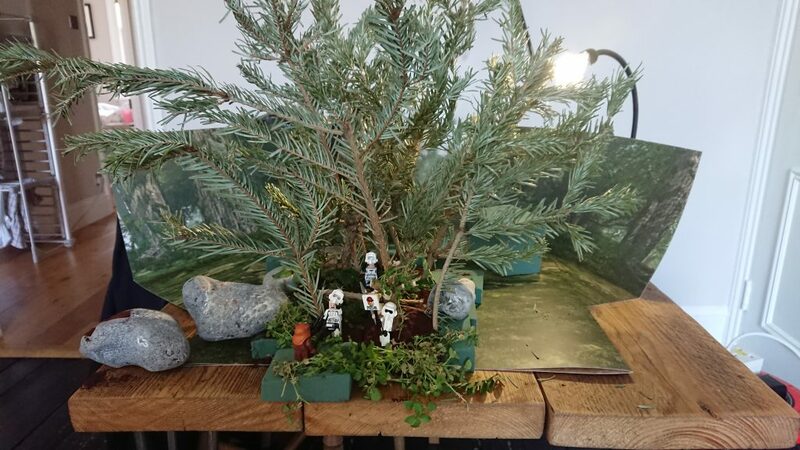 To create my forest scene, I used branches from a Christmas tree. To help add a more natural feel I varied their length and widths and kept the pine needles on some while shaving them off from others. Off cuts from my local florist were used as foliage for my forest floor. Oasis, also purchased from the florist, worked perfectly to keep the branches in place, even at angles. On the way back I gathered some rocks from my local beach. I wanted to force the perspective in my shots so I staggered the branches, wider at the front and more bunched up at the back. 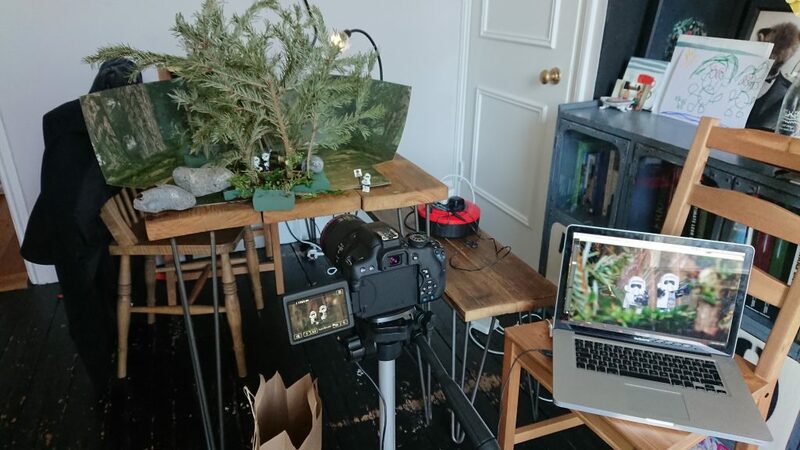 In order to create a further sense of depth I used a photographic forest backdrop (from Bakku backgrounds) and built my scene on top of that. To light I used a combination of natural light and a few additional lights. I wanted a dappled lighting effect and so used a single spot and shone it through as many branches as possible. To create extra atmosphere, I used an Atmosphere Aerosol spray – but sometimes overdid it! Once I had my scene and was happy with my lighting setup I needed a story to shoot. 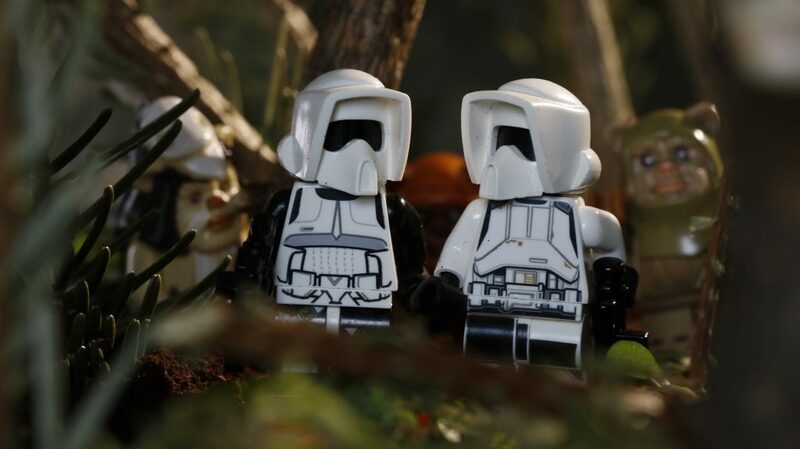 I always loved the costume design of the Scout Troopers and so wanted to use them as my main characters. 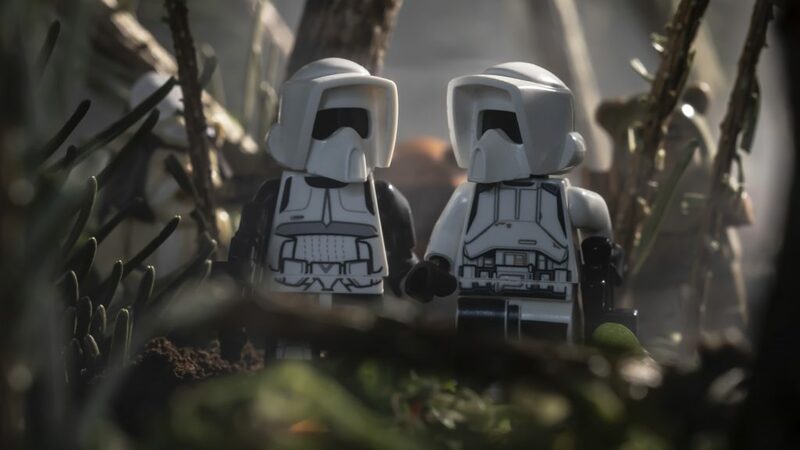 I came up with the idea of two troopers called Tony and Kenneth (very unassuming non-Star Wars names) who had recently been deployed on a recon mission to Endor. They think they’re the Empire’s finest but actually they’re completely incompetent. Each shot required a slightly different approach and different techniques but everything was shot on my lens of choice, a 100mm Macro. I shot through the forest to add both depth and interest to each shot. For the first I used white putty to help pose the troopers (I always use white as it’s easier to hide) and used some custom Area Light blasters to enhance their look. 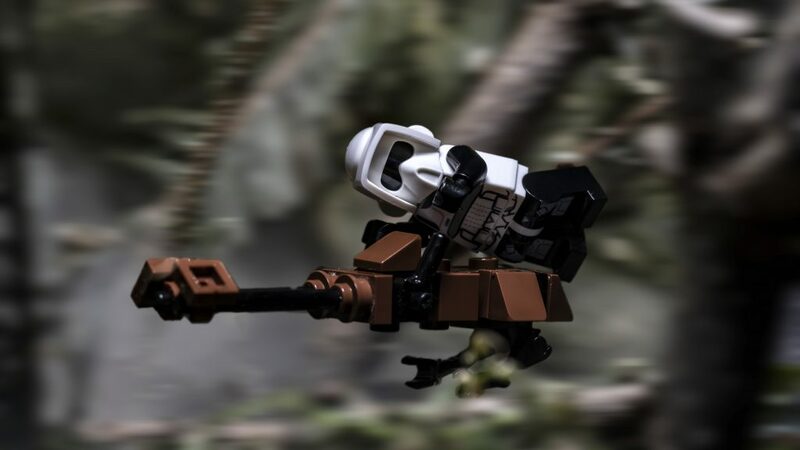 For the speeder shot I built a speeder bike moc (the instructions for which can be found here https://www.instagram.com/p/Bdfda_FDJBJ/?utm_source=ig_web_button_share_sheet) My initial shot had the troopers helmet flying off revealing a terrified look underneath. But after thinking about it I decided to keep the helmet on, which I felt let the viewer make up their own mind as to what the trooper would be feeling. 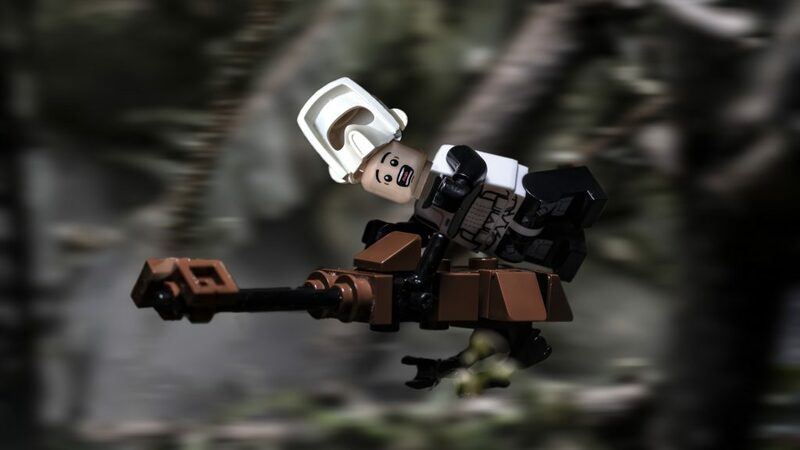 I also added a motion blur in Photoshop to give a sense of speed. 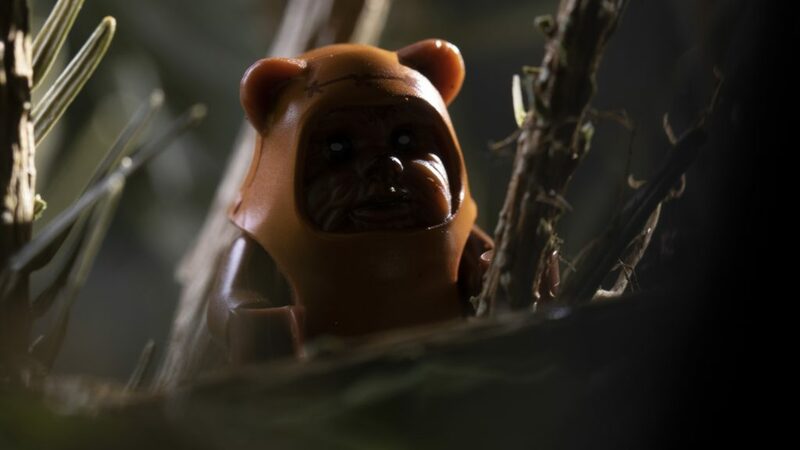 The third shot – the walk through the woods – is both my favorite of the series and the longest shot to achieve. Not because it was technically difficult but my initial shots just didn’t look right. 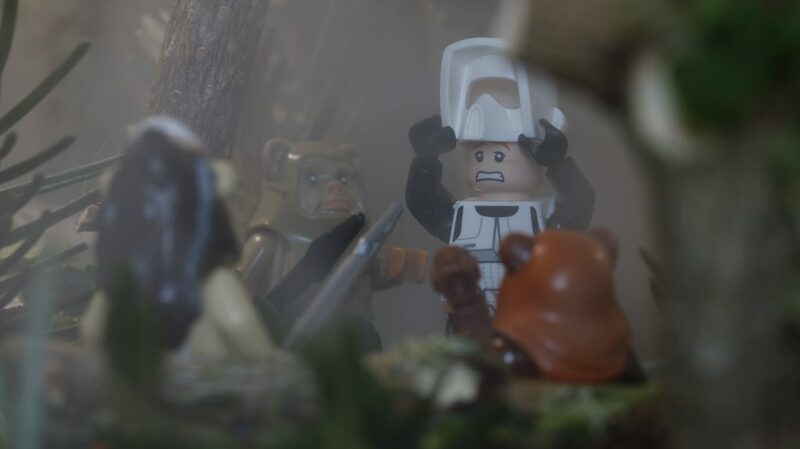 I think they were too front lit and it was pretty obvious that Ewoks were standing right behind the troopers. 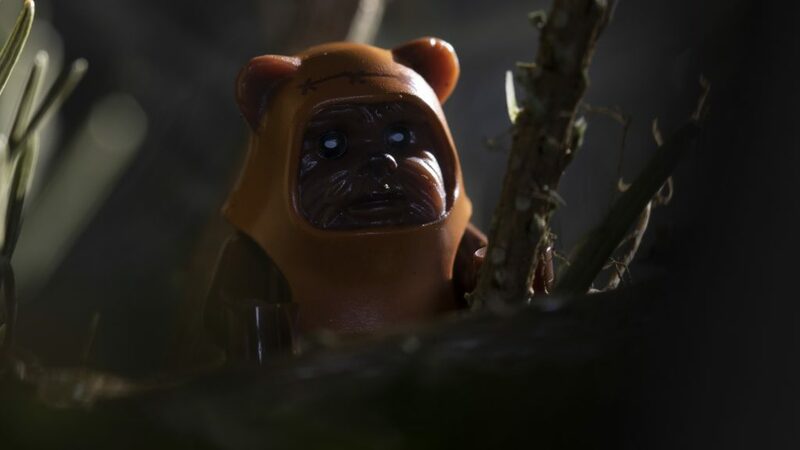 So for the final image I dialed down the key light and hid the Ewoks behind some trees. 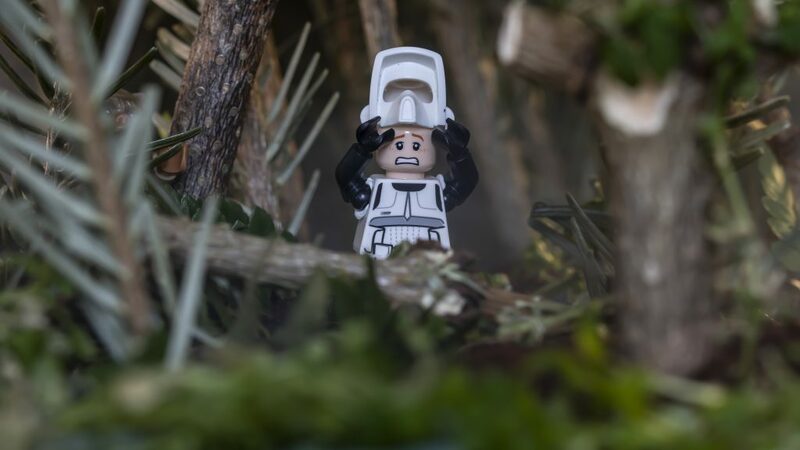 The Wicket close up was 100% inspired by my personal LEGO photography hero Vesa Lehtimäki (aka @avanuat) and his book Small Scenes From A Big Galaxy. I used a lot of aerosol spray for that shot and went through a number of different lighting setups before I was happy with the final shot. I don’t think it’s a patch on Vesa’s work but I’m happy with it. 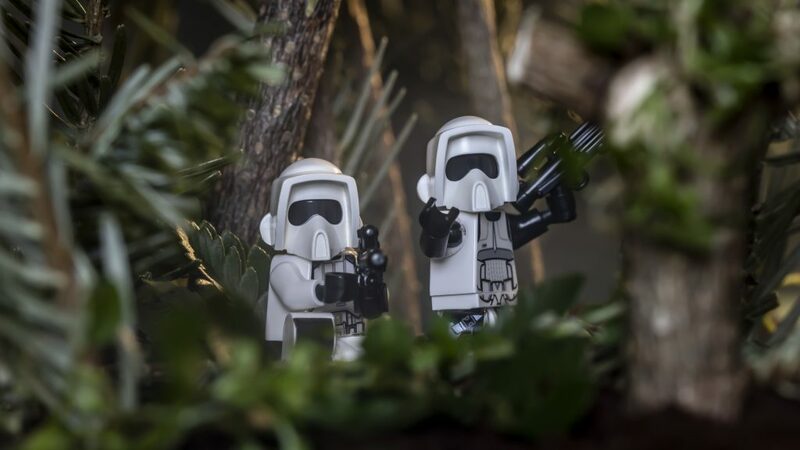 For the trooper surrounded shot I again used white putty to pose the Minifigure in place and also added some highlights with an extra light shining through the left of frame. 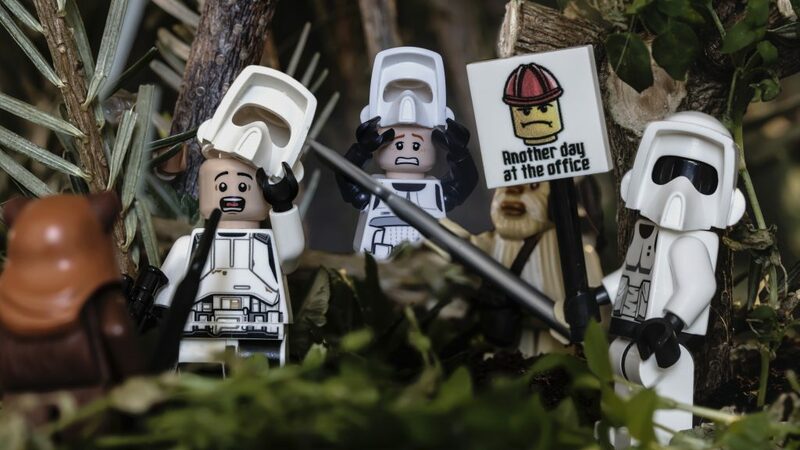 For the final shot I used a custom tile (from brickemoji) with ‘another day at the office’ printed on. 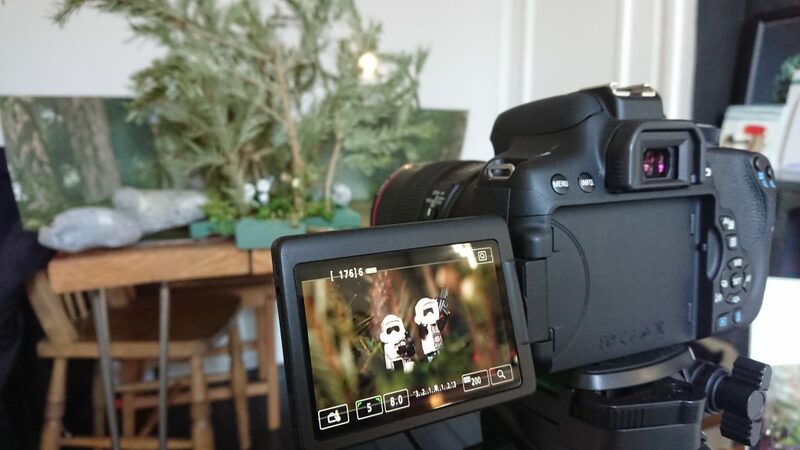 I thought it would add a sense of fun to the scene and help convey the message of the final shot. I used a technique called focus stacking. For those unfamiliar with the term, I shot the same setup a number of times but changed the focus of each shot. 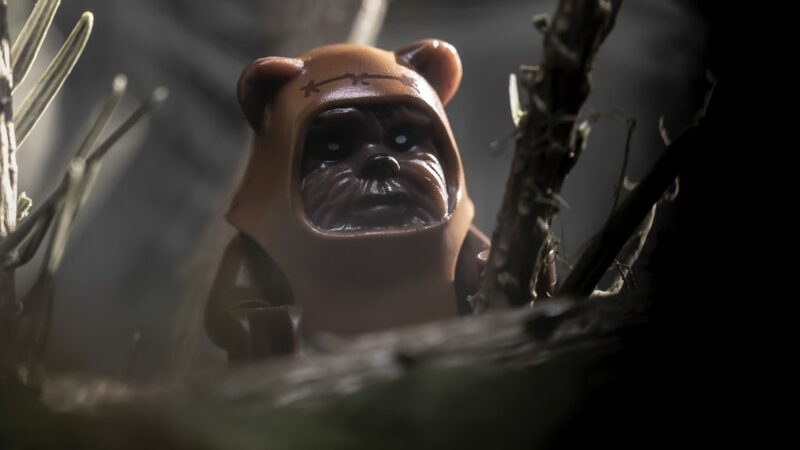 I then comped the shots together so every trooper and Ewok in the final image was in focus. 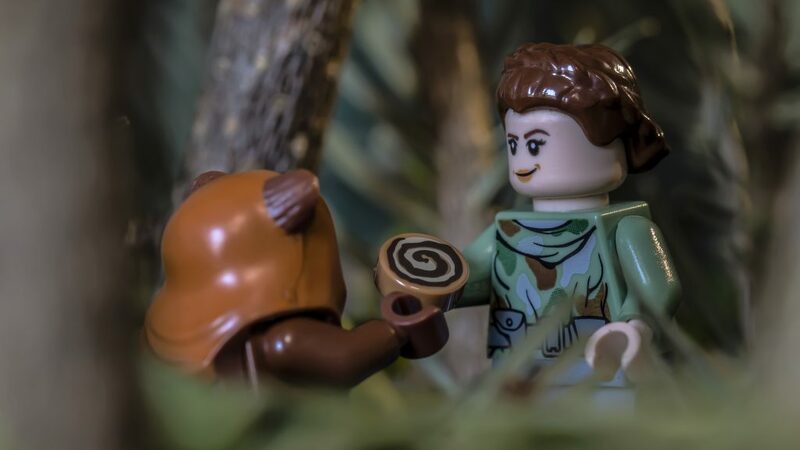 I did take a couple of other shots – one being based on Wicket and Princess Leia’s first meeting. 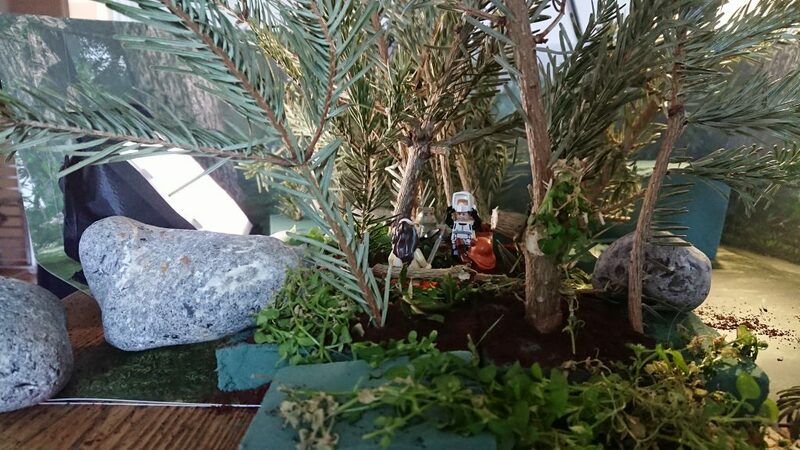 The second was Han, Leia and a rebel trooper walking through the forest. They’re ok but I prefer the storytelling of the six-part series. Overall this project was a lot of fun and I certainly learned a lot. I have since experimented with different backdrops and props. 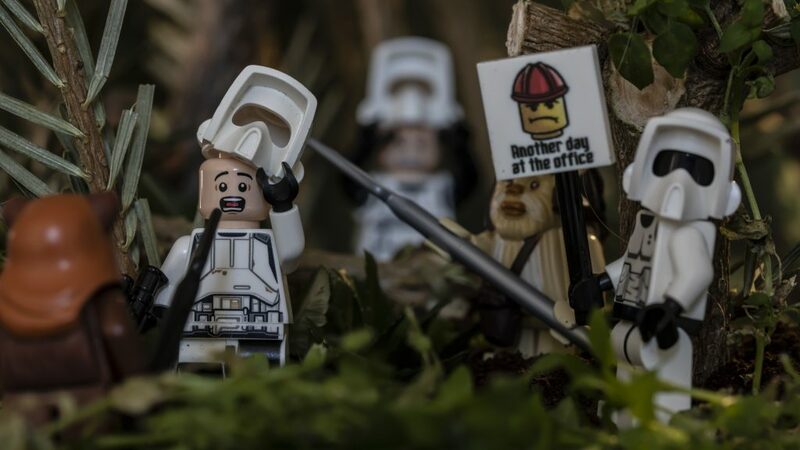 I absolutely love building with LEGO and so I won’t ever stop using brick-built backdrops but it’s nice to have pushed myself out of my comfort zone and it’s certainly given me options for future setups. Thanks for sharing this was a really fun narrative6 as well as the BTS. Thanks for sharing Dimitri. I appreciate also the thoughts behind the shots, it really adds something to the whole BtS post. 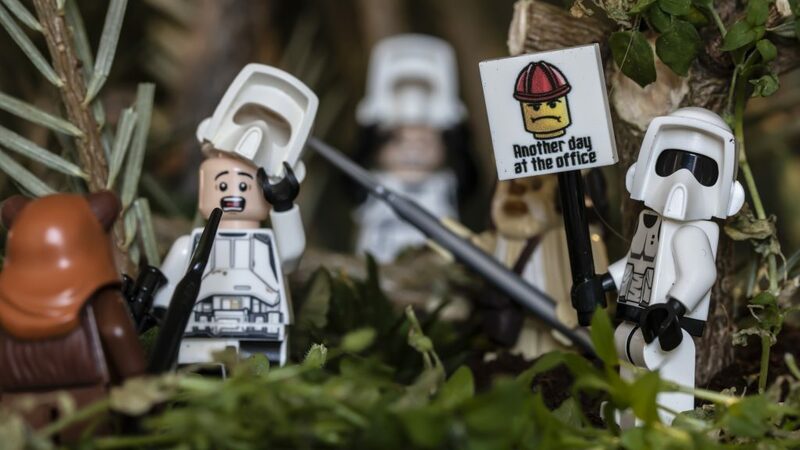 By the way, i love the trooper with the helmet flying off! Probably my fav of the whole series (even if it did not make the cut)! Thanks Marco. I appreciate your kind words. One of my favourite things about photography is how subjective it is! I’m glad I included the b-side shots in the BTS! I loved seeing your setup and learning about your process. Thanks for sharing! Thanks Wade. I’m glad you found it interesting. It was certainly a lot of fun putting it all together! What a terrific, in-depth, and detailed BTS. Having seen the Six Image Narrative, and then getting a glimpse at what was involved in creating it really added so much to this this post. Thanks for letting us behind the scenes Dimitri! Thanks Brett! I’m pleased I decided to step out of my comfort zone, and happy you guys like the results! I appreciate you guys wanting to feature my work too!